The TOEIC® Speaking and Writing tests measure a person's ability to speak and write in English in general and workplace environments, using key expressions and common, everyday vocabulary. The Speaking & Writing test maintains ETS’s high standards, and uses a centralised team of scorers based in Princeton where every test is scored and checked by at least 3 scorers. 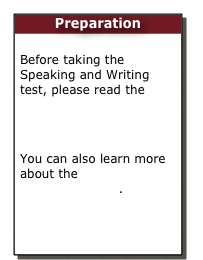 Speaking or Writing tests are also available individually. There are 3 options for the Speaking and Writing test taken at an Authorised Test Centre. Institutional testing uses a client’s computers to administer the Speaking & Writing tests. It is administered by the institution, at any time of the month, for its own students. Since it is administered by a school and uses one of the existing forms, it is considered “semi-secure”. The resulting score report is valid for the institution in which it was tested, or a partnering institution. Performed by an ETS representative (a Public Authorised Testing Centre) at any time of the month, at the test centre premises or at client premises. We will verify the resulting score report when requested (within 2 years of the test). on specific dates and times. Public testing of Speaking and Writing produces a Official Score Report accepted internationally, and verified by ETS internationally. Testing is controlled worldwide to ensure the highest validity of test results. Please see our public testing dates and locations. Contact us to enquire about the above.